Peter Davison is the Doctor in Iterations of I. To some people, mathematics comes easily. To others, it’s nearly impossible. To a select few, it holds the keys to the secrets of the universe. No matter where one goes – a different culture, a different country, a different planet, even a different galaxy – math is the one constant they never changes. Wherever you go, the square of the hypotenuse of a right triangle is equal to the sum of the squares of the other two sides. The ratio of a circle’s circumference to its diameter is approximately 3.14159 whether you’re on Earth, Jupiter, the Death Star, or the USG Ishimura. When the Voyager probes were launched in 1977 on a journey that would take it beyond the limits of our solar system, scientists included a golden record that contained several mathematical equations, constants, and concepts, figuring that an advanced society would be able to decode the numbers. This would allow them to figure out at what RPM the record should be played as well as using the pictographs and formulas on the surface of the record itself to figure out the origin of the Voyager probe; a pale blue dot called Earth, far beyond the stars. What if, somewhere in another time or another dimension, there was a creature so absolutely alien and foreign to us that the only way to not only communicate with it but to just perceive it, was through the use of mathematics? And what if the creature’s “form” of choice was the most imaginary of numbers? Penned by a Big Finish veteran, Iterations of I finds the Doctor, Adric, Nyssa, and Tegan trapped on a mysterious island off the Irish coast, hunted by a creature they can barely comprehend. Starting off with a creepy atmosphere and ramping up from there, the TARDIS quarter turn in a great performance with a script that adds tension, humor, science, and action together for an adventure that’s easily more than the sum of its parts. The mansion on Fleming’s Island has seen death before. First, the young wife of its namesake owner died in a locked room decades earlier. Then a cult took advantage of its drop in market value to move in and conduct their rituals in privacy, before mysteriously vanishing without a trace. Now, it’s the Doctor’s turn. After a botched landing by Adric and Nyssa renders the TARDIS unreachable, the three of them, accompanied by Tegan, seek shelter in the house from a brewing storm. Inside, they find huge computers, rows of databanks, smashed radios, and cut telephone lines. Outside, they find a boat rendered unusable and several hastily dug graves. Joined by the local constable, a pair of poachers, and the boyfriend of a scientist hired by the cult before their disappearance, the mystery of Fleming’s Island begins to unfold. What were the scientists working on before turning their anger on the equipment? What secrets rest in the databanks of the vast computers? And why does the psychically attuned Nyssa struggle to enter the mansion? The answers can be found in one simple letter with many meanings. 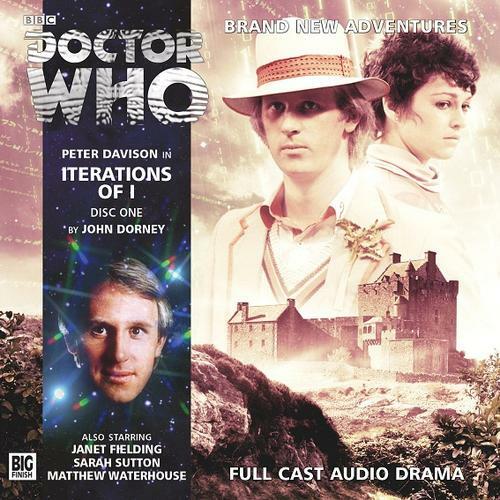 i. i. i. i. i. i. i.
Iterations of I is the second story in the Fifth Doctor Box Set from Big Finish, reuniting the cast of Peter Davison, Sarah Sutton, Janet Fielding, and Matthew Waterhouse. The first story in the set, Psychodrome took place early in their adventures, immediately following the first televised serial for this particular lineup. In contrast, Iterations of I takes place near the end of their time together. This story slides right between the television serials Black Orchid and Earthshock, complete with a reference to Cranleigh’s book of adventures and the presence of early 1980’s computing technology which could take up an entire room. It’s a very good place in continuity for this this serial, as it easily allows for any number of new journeys for this particular collection of companions before the tragic death of Adric at the end of Earthshock. As opposed to the “getting to know you” thread that was woven into the fabric of Psychdrome, the TARDIS is a tightly knit family by the beginning of this story, as shown by the fact that Tegan has become a willing member of the crew as opposed to stressing about getting back to Heathrow. They still bicker and snipe at one another, but with love and respect as opposed to doing so out of uncertainty and strife. John Dorney is a long time veteran of Big Finish Productions on both sides of the microphone. He starred in stories such as Faith Stealer, The Last, and A Death in the Family, as well as playing part of Bob Dovie in the 50th anniversary audio The Light at the End. He’s also penned over a dozen stories for Big Finish, including the Fourth Doctor Adventure The Wrath of the Iceni and the acclaimed Companion Chronicle Solitaire, with India Fisher reprising her role as Charley Pollard. Dorney puts his experience to good use with this script, easily one of the strongest Big Finish has offered. The first episode sets the mood for the story, as it’s obvious that something is amiss with the house on Fleming’s Island. Not only is it devoid of life, but the scientific equipment has all been smashed to pieces…except for the computers. Nyssa’s psychic openness, touched upon in Kinda, Snakedance and Primeval also comes into play, establishing that there is indeed something “wrong” with the mansion. The second episode slowly ramps up the slope on the tension, using a few standard haunted house tropes such as an open window and whispering voices, but also using those tropes to help with the introduction of the mysterious creature. Instead of introducing it all at once, Dorney’s script establishes its presence and its capabilities through not only its reactions to the characters, but through the use of a scientist’s personal audio journals that adds up the evidence into one horrifying equation. The third episode is a good bit of scientific explanation and technobabble, but it gives the surviving characters a chance to all put in their two cents and lay out exactly what they’re up against. The fourth episode pulls it all together with a kidnapping, a desperate chase, and an ending that, while slightly cheesy, shows the power and the proof of true love. Dorney’s willing to also use humor to break the tension and give the listener and characters a moment of relief, either through the Doctor’s mid-sentence concern about Adric and Nyssa flying the TARDIS, the “I didn’t scream” reactions of the secondary characters to something spooky that’s just happened, or by using Tegan either as the recipient of a joke or the giver of one. But when the tension come back, it comes in a very simple but effectively horrifying way, as the victims of the entity on Fleming’s Island are, through the use of voice modulation and a simple scream, reduced to their component digits in a way that’s absolutely chilling on audio. While listening to this story, I was reminded of the Sixth Doctor audio …ish about a sentient word. And also of the 1980’s horror movie by John Carpenter, Prince of Darkness, about a group of scientists studying a canister of mysterious fluid that contained the essence of “Anti-God.” Iterations of I definitely leans on mathematical and scientific concepts to tell its story and does so in a very solid manner, almost like something out of a Christopher Bidmead serial. The technobabble and background to the number fits inside the story’s framework in a very snug manner, thanks to the presentation of the audio logs and the third episode group “data dump.” The complex concept of the monster challenges the listener to pay attention to the story to understand what’s going on, making the payoff even better once all the pieces are in play. They might get a little lost in the weeds at times, but Dorney keeps the explanation tight, pulling all the threads together in a way that will make a listener go “ok, I don’t quite understand the concept, but I get the idea.” And just when it looks like the serial is going to pad time on the way to the climax, there’s an action brought about by a human character that makes perfect sense and doesn’t feel forced in, leading to the big chase scene and escape from death that punctuates the fourth episode. The only concern I had with the script for this story was the “love conquers all” type of ending, but in a unique way it manages to channel the “everyone’s dead” ending from Warriors of the Deep on a more positive note. I’m going to step out on a limb and make a bold proclamation. After Spare Parts, this just might be Peter Davison’s best performance with Big Finish. At least, it’s the best one I’ve heard from him in a long time! Maybe it’s just the fact that the last time I listened to a Davison audio (before the Box Set) was in July, where an excellent Davison performance was dragged down by the low quality of the story itself. That’s right, I’m looking at you, The Roof of the World. Where Psychodrome gave us a Doctor still coming to terms with his regeneration and the strangers in his TARDIS, Iterations of I gives us a more confident Doctor, one willing to make educated guesses, but also one willing to admit when he’s wrong. What Davison adds to his performance this time out is the sense of unease that the Doctor is feeling about the whole situation. Restoring the lights is his primary concern, he loves to hear local superstitions as they might give insight to the current situation (such as figuring out a locked room has a hidden window switch), and he’s willing to admit that he doesn’t know for certain, but it’s his best guess. Perhaps the highlight of Davison’s performance is showing just how clever the Doctor can be; the creature might be evil, but it also just might be trying learn, or “iterate,” how to communicate with a different dimension…an experimentation process which is invariably fatal to humans! Is the creature evil, or curious? Whatever it is, one of the story’s highlights is when the Doctor manages to distract the creature with nothing more than a simple analog calculator! 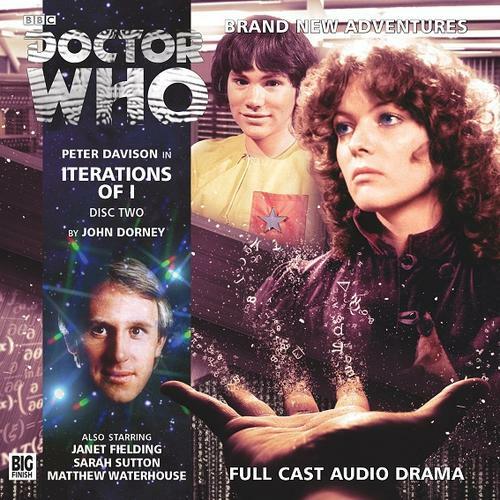 Iterations of I is a story tailor made for the character of Adric, math genius. Matthew Waterhouse pitches his voice upwards in an effort to match his it to Adric’s age, which is a bit jarring, but more readily acceptable if one’s listened to Psychdrome beforehand. With his curious nature on display, as soon as Adric realizes the situation that he and his friends find themselves in can be quantified at a complex mathematical equation, he leaps into action in an attempt to both solve the nature of and then trap the creature inside a series of numbers. Adric is confident, but there’s also a hint of desperation in Waterhouse’s performance. At the very beginning of the story, he’s attempting to fly the TARDIS in an attempt to impress the Doctor! In the third episode, while the Doctor is explaining everything, the listener can hear Adric working in the background, typing on the keyboard and ocassionally adding his own opinion and thoughts, but otherwise entirely focused on the task at hand. It’s nice to have Adric’s attempts to catch the creature take several minutes to set up, showing its complexity, as opposed to the standard “a few keystrokes and we’ve caught him” cliché that often shows up with computers. At the end of the story, when Adric is taken hostage (oh, ADRIC), his Alzarian side comes into play as he struggles with his captor, a nice call back to his alien origins. If anything, Waterhouse’s performances in both of the Fifth Doctor Box Set audios show that he’s matured as an actor and some of Adric’s flaws as a character could be placed on the writers and his own immaturity. If Adric came back for another audio TARDIS go around, I definitely wouldn’t approach it with trepidation based on the strength of Waterhouse’s return! It took a while to get Janet Fielding back into the TARDIS, but so far she’s taken the opportunity to run with the character that Big Finish has given her and made Tegan a joy to listen to as opposed to a shrill harpy. Much as we’re dealing with an “older and wiser” Adric in this story near the end of his character arc, we’re also seeing how Tegan has adapted to life inside the TARDIS. She’s willingly on board with the Doctor, forgoing the chance to go back to Heathrow from Ireland in order to travel alongside him. But this doesn’t mean Tegan’s a pushover by any means. Janet Fielding plays Tegan as smart and intelligent enough to know that it’s time to get the hell off of Fleming’s Island. The character is still sarcastic and thinks she’s the only sane person in the room, but she’s definitely a softer character then we heard in Psychodrome. Her and the Doctor (really, Fielding and Davison) trade barbs back and forth, but not in the “what the hell is wrong with you” kind of way, but in the “yes, yes, the creature will go for the loudest person in the room, thank you for pointing that out” vein. And she also points out that while the Doctor might seem insane, listening to him is usually the safest option. Tt’s Tegan who cuts through the third episode bull session with the simplest of observations from growing up in Australia where everything is trying to kill you. Every creature has a weakness. All they have to do is figure it out. Once again, the presence of Janet Fielding and Matthew Waterhouse overshadows Sarah Sutton’s solid performance as Nyssa. Her weakness to psychic attacks sidelines her a bit during the opening scenes, but this established her as a conduit for the mysterious creature. Nyssa is the first to fall under its spell, caught in a recursion loop and repeating the letter…or number…i over and over again. Once recovered, Adric suggests that a little light electrical engineering might be just what she needs…and we all know Nyssa is just square enough that fixing a radio is definitely what the doctor ordered. With math as the scientific basis for this story, Nyssa’s expertise in biological and physiological matters takes a back seat, which makes Nyssa do a bit more of the background “heavy lifting” as it were, with a slight focus on the death of her father in The Keeper of Traken and how she’s come to terms with it during a quiet scene with one of the secondary characters. This doesn’t mean her performance should be considered anything less than the quality turns Big Finish listeners have come to expect from Sutton, it just means that her presence is downplayed as opposed to Tegan’s and Adric’s. The supporting cast focuses on the lovers of Imogen Frazer, played by Allison McKenzie, and Joseph Radcliffe’s Jerome Khan. A students of Maths at university, Frazer is only heard through the apocalyptic audio logs that the Doctor finds in her bedroom. McKenzie does a great job going from excitement at discovering the new life form to unease as they attempt to communicate with it to sheer terror as she realizes it won’t let, or any of the cultists, depart the island. Radcliffe’s performance goes the other way, anxiety at his lover’s fate giving way to acceptance at her death, ending with a hint of hope at what might be to come if Jerome is willing to take a calculated risk. Andrew Macklin does a fine job as Robert DeValley, the corrupt local constable who wants nothing more than to get everyone off the island with all their pieces intact until he realizes that the mouthy mathematician could manipulate the Stock Exchange and make him a pretty penny. And in the role of “secondary characters that provide exposition, answer questions, and get a bit of development before dying horribly” is the stellar pair of Teddy Kempner and Sinead Keenan. Fool Circle Productions once again deserves a notation for the fine audio landscape they lay out with this story. The computers and printers sound like they could have come right out from the 1980’s, complete with dot matrix printing and the loud clacking of keys being punched. The desolation of the island, save for the howls and wind of the oncoming storm, really comes across with the cries of seagulls and waves crashing against the shore. The sounds of the creature’s attacks, at mentioned earlier, stand out for the use of voice modulation and the simple deconstruction of its victims into their simplest forms come across as spine-tingling when heard on audio. The highest praise I can give this serial is that I wish it had been done on television! Using a dilapidated mansion set and an updated version of the special effects from The Mind of Evil, a tale like this could have been a definitely “jump behind the couch” story. The cast and crew takes the script from John Dorney and run with it, giving Big Finish one of its best stories in years. Combined with Psychodrome, the Fifth Doctor Box Set is a triumph for the company and a great return for Matthew Waterhouse to the role he’s best known. Nicola Bryant is the companion is…Peri and the Piscon Paradox. This entry was posted in Big Finish Review and tagged Adric, Doctor Who, Doctor Who Audio, Doctor Who Review, Fifth Doctor, Fifth Doctor Box Set, Janet Fielding, Matthew Waterhouse, Nyssa, Peter Davison, Sarah Sutton, TARDIS, Tegan. Bookmark the permalink.